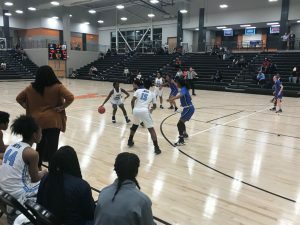 The James Clemens girls basketball team has won 7 of their last 9 games heading into tonight’s Area 8 tournament championship game with host team Austin. No win perhaps in school history was more important than the 51-37 victory over Florence on Wednesday night. With the victory, the Jets are assured a slot in next week’s Northwest Regional Tournament in Hanceville. It will be the first time the Lady Jets will advance to the regional tournament. The Jets trailed early and led by only one point at the half and the end of the third period but outscored the Falcons by a 13 point margin in the fourth period to advance in the tourney and end Florence’s season. Eighth grader Nyla Collier led all scorers with 23 points and also contributed 6 rebounds and 3 steals. TK Grandberry contributed 7 points, 3 assists, and 2 steals. Bria Junerick had 6 points, 7 rebounds and Regan Williams had 5 points and 2 steals. The Jets overall record is at 12-12. The championship game for the Area 8 Tournament is tonight at 7 PM at Austin High School.